It’s friday!! That means it’s the weekend, and the weekend (especially right before Christmas) means parties and get-togethers. 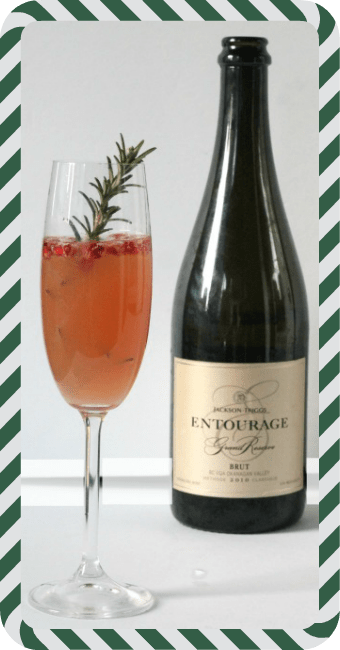 This time of year, I like to make use of seasonal ingredients, and this cocktail does exactly that–and adds some celebratory sparkling bubbles into the mix, as well. 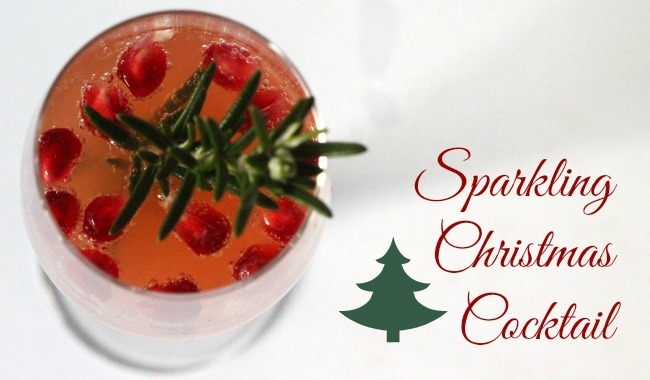 Anything with bubbles feels like a celebration, but this cocktail combines some Christmassy elements as well, like pomegranate seeds, cranberry juice, orange juice, and rosemary, which both smells and looks like a Christmas tree. By the way, I’m using a local wine here–you can’t call it champagne, because it wasn’t grown in France, but this lovely sparkler from the Okanagan has lively notes of lemon, apple and vanilla. I’m a big fan of Jackson-Triggs. Their 2012 Black Label Merlot is my go-to wine pick–it’s inexpensive and perfect for sipping at home snuggled under a blanket on the couch while watching the Shaw log on TV. This cocktail would be lovely with your turkey, at a NYE party, or at a brunch. I served it at a brunch I hosted last weekend, and it was a big hit. Make the rosemary simple syrup: in a small saucepan, combine one cup sugar with one cup water, and add a good sprig of fresh rosemary or two. Bring slowly up to a simmer, allowing the sugar to dissolve. After all the sugar has dissolved, allow it to simmer slowly for about 5 minutes, just to let the rosemary infuse the simple syrup. Remove from heat, allow to cool, then strain. To make the cocktail: in the bottom of a champagne flute, place about a teaspoon of pomegranate seeds. On top of that, add the cranberry juice, rosemary simple syrup and orange juice. Fill almost to the top with the sparkling wine. Garnish with a sprig of rosemary and cheers!